A hearing at the U.S. District Court in Sacramento was scheduled for March 7, but please note that it has been postponed and will now be held at 11am on March 21. The Honorable Morrison C. England, Jr. will preside. We would welcome your presence at the hearing as we fight together to protect the Constitutional rights of California physicians and patients. Today AAPS filed a memorandum and points of authorities brief to address questions from the court related to how AB 72 applies to Medicare, Medigap plans, and patients who seek care from physicians with non-par status or opted out of Medicare. SHELLEY ROUILLARD, in her official capacity as the Director of the California Department of Managed Healthcare will be heard at the Federal Courthouse in Sacramento on Thursday, March 7 at 2 PM. The Honorable Morrison C. England, Jr. will preside. Please make every effort to attend the hearing. The more support the better. There are powerful forces arrayed against us including government, labor, organized medicine, insurance companies and others. The Constitution reigns supreme and was written to provide protection against coercion and subservience. AAPS is not done with this issue. It will be litigated as long as it takes to get this law overturned.Why should our profession’s autonomy be surrendered even more than it already has been? Kudos to the courageous California physicians standing up with and for their colleagues and patients against this bad bill. Our challenge to AB 72 went very well in federal court on Thursday, where we are litigating Association of American Physicians & Surgeons v. Brown, Gov. of California, et al., 16-cv-2441-MCE. 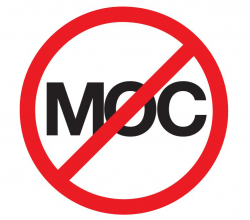 California AB 72 authorizes insurance companies to impose their own in-network rates against all physicians. If AB 72 is not blocked, reimbursement rates for all physicians will soon be reduced to only 125% of Medicare. Many concerned physicians attended this hearing in federal court in Sacramento, and all were pleased by the thorough understanding and concerns expressed by the Court based on our submissions and presentation. At the hearing we emphasized how AB 72 does not allow any practical way to challenge the adequacy of reimbursements, which is a violation of due process. Rent control laws, for example, are unconstitutional if they lack a means to challenge the fairness of the price controls. AB 72 also constitutes an unconstitutional takings from physicians who have invested so much in their medical licenses but are prevented from recouping a fair return on their large investments in their careers. The Court expressed particular concern about whether AB 72’s mandatory, binding arbitration for fee disputes is constitutional. AB 72 denies physicians timely access to the courts to challenge inadequate reimbursements, and instead forces them to pursue impractical internal review procedures with insurance companies followed by a binding arbitration system. The Court requested additional briefing on this potentially unconstitutionally foundation of AB 72. Striking this arbitration procedure would end AB 72. The Court also probed additional aspects of the unprecedented AB 72, which is already making it difficult to practice outside of insurance networks and is quickly driving reimbursements lower. In response to a suggestion by the State that physicians do not have to see patients out-of-network under AB 72, the Court mentioned AAPS’s assertion that fewer out-of-network physicians could result in less care for uninsured, underserved communities, charity work often shouldered by out-of-network doctors. In addition to my arguments on behalf of AAPS, attorney Marc Del Piero made a well-received presentation at the hearing against AB 72 on behalf of amicus Physicians Advocacy Council. The Court also read into the record its receipt of letters from four additional physicians’ groups in California which support our side in our challenge to AB 72. AAPS vs. Brown, our challenge to AB 72 and its attack on independent physicians and their patients, will get its day in court this Thursday, Ocbober 19, at 2pm. You are welcome to join your colleagues at the Robert T. Matsui United States Courthouse in Sacramento to hear the proceedings as AAPS General Counsel, Andrew Schlafly, argues the case before Judge Morrison C. England, Jr. 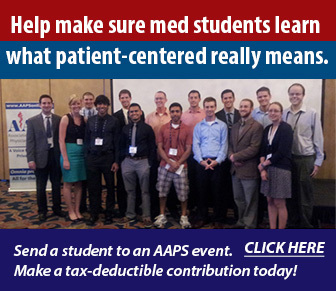 Please bring a friend, a physician or patient … anyone is welcome. We will have press present. No white coats. Just professional attire. More details about this crucial lawsuit can be found below. A horrendous anti-physician bill was just signed into law by California Governor Jerry Brown, and we are suing to stop this bad idea before it spreads nationwide. The bill imposes wage-and-price controls against physicians, and allows insurance companies to set the rates for all physicians, even those not under contract with the insurance companies. This is a devastating blow to the practice of private medicine, unless we stop it in court. Falsely promoted as a fix for “surprise medical bills,” this new law (AB 72) hands control over to insurance bureaucrats to essentially decide what out-of-network physicians will be paid for life-saving medical care. Independent doctors, already under attack from all directions, could be forced to shut their doors. Patients are having a hard enough time as it is finding doctors and this scheme will only exacerbate the physician shortage. While other medical associations have already waved the white flag of surrender and are refusing to challenge this law, AAPS and its members will never back down when it comes to standing up for physicians and patients. Today we filed suit in federal court to stop this law. We must be straightforward with you: this battle is not going to be easy and it’s not going to be cheap. We are going to need all hands on deck to beat back this harmful legislation before it roars across the country. 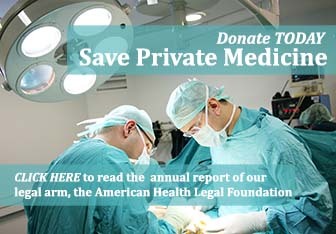 Your tax-deductible contribution TODAY to our American Health Legal Foundation will go directly to fund this crucial fight. Please visit http://AmericanHealthLegalFoundation.org to pitch in to make sure we have the resources to effectively pursue this lawsuit. Other states have passed balanced billing bans, that limit patients’ out of pocket costs, but none are as brazen and this new California law. It basically prohibits billing the insurance company more than what it wants to pay! If unchecked, other states will soon be following California’s lead to the detriment of doctors and patients. The Act [AB 72] violates the U.S. and California Constitutions in at least three ways. First, the Act violates the Due Process Clauses of the U.S. and California Constitutions by delegating rate-setting authority to private insurance companies, with respect to physicians who are not under any contract with the insurance companies. In addition, the Act is unconstitutional under the Due Process Clauses by requiring arbitration for the out-of-network physicians on their reimbursements, thereby denying them their due process rights in court on their claims. Second, the Act violates the Takings Clauses of the U.S. and California Constitutions because the Act empowers private insurance companies to deprive out-of-network physicians of the market value for their services, and arbitrarily denies them just compensation for their labor. Third, the Act violates the Equal Protection Clauses of the U.S. and California Constitutions by having a disparate impact on minority patients for whom the availability of medical care will sharply decline as out-of-network physicians are coerced by the Act to withdraw services from predominantly minority communities. To read the entire initial complaint CLICK HERE. We are asking for an immediate injunction to stop this unconstitutional law from going into effect. Thank you to all our loyal members and friends for making this action possible! Your continued support today will amplify the force we can apply to this pivotal case.